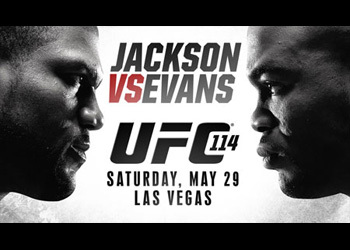 “UFC 114: Rampage vs. Evans” took place Saturday night inside the MGM Grand Garden Arena in Las Vegas, Nevada. According to UFC president Dana White, 15,081 fans packed the arena, garnering the company $3.895 million at the gate. Dana White: A subdued White took the mic during the presser and was visibly disappointed in the performance his former light heavyweight champs put on in the night’s featured contest. Quinton “Rampage” Jackson: Admitted ring rust played a major factor in his return and requested a rematch multiple times after the fight. He also said he normally performs well under pressure, however the A-Team movie supplied an inordinate amount of heat. Rampage added that FOX threatened to sue him if he lost the fight. Rashad Evans: Was happy with the win, but clearly disappointed he couldn’t finish Rampage. In addition, it was the second straight fight he had well in hand, however manged to get into deep trouble in the final round.